... definitely not your typical lemonade and cookie tour! Also riding is Lara Sullivan, who participated in the Eastern PA Fleche in 2008. Best of luck to all the riders participating in this extremely tough tour. With nearly ideal weather conditions, and a course that is perhaps a bit kinder and gentler than many of the other Eastern PA 200k's, all 18 starters made it to the finish well over two and half hours ahead of the time limit. First finisher Don Jagel just missed the course record of 7:43 (held by Greg Pedano and Len Zawodniak) by 7 minutes. That record was set on very similar weather conditions: generally cool weather with a strong northwest wind that was a real boost for the run into Port Jervis along Rt 97. Incidentally, the first couple of brevets back in 2007 were routed along Rt 97 in the other direction, from Port Jervis to Barryville. As I recall, we'd typcially get to Port Jervis in the early afternoon just in time for the westerly winds to kick up and make that stretch a real upwind slog. In addition to the favorable winds, the direction to Port Jervis from Barryville generally has a better shoulder, especially in the narrow section near Hawks Nest. Special thanks to Ed Pavelka, for carrying the sign-in sheets and Andrew Mead, for helping out at the finish. And thanks for all the contributions for the benefit of the Water Gap Diner ... altogether, $265 was raised. Larry Brenize gets my vote for the "Iron Stomach" award. I met up with him at the Port Jervis diner. As I waited for my black and white milkshake at the counter, Larry was working on a deluxe cheeseburger with all the fixings that looked like it weighed in around 1/2 lb. By the time I finished my milkshake, the burger was gone, and Larry was then working on a rather substantial chicken sandwich (again with all the fixings). I'm not sure how he managed to get up the big climb in the DWG park, after all that! Don Jagel writes: "Boy, what a beautiful ride. The weather, woods, views, rivers; wow! ... Route 390 is really great being in the woods with the nice rock outcrops and occasional views, particularly just north of Skytop lodge. ... Egypt Road and Gumbletown Road, connecting Route 390 to Route 420 were new roads for me. Nice find. I haven't ridden along the Lackawaxen River from Kimbles to the Delaware River since the late '80s. I love that stretch of river, and also the northern Delaware River. ... The views from the overlooks along Hawks Nest are some of the most spectacular in this region and alone make this ride worth doing. After quick stops in Port Jervis and Layton I got to my "favorite" climb along Mine Road which just reminds you that you still have to work a little to get to the end. All in all, spectacular! ..."
Andrew Mead writes: "What a great day for a ride. Congratulations for holding the nasty weather demon at bay for a day. The route was beautiful and reminded me why I like the towpath along the Lackawaxen River down to the Roebling Aquaduct so well. It was much more enjoyable in the downhill direction. Winds didn't seem to be as challenging as predicted. The boost down Rt 97 was superb. The Water Gap NRA is always a treat. Here's a link to the GPS for the ride. Joe Kratovil writes "... Many thanks for putting on this great ride. My friend Al and I enjoyed it immensely. The route has the nicest scenery of any brevet I've been on so far. We also enjoyed the company of many other riders we met along the way...."
Christine Oh was among the several first-time riders. Christine and riding partner Harold Axelrod are both training for the Lake Placid Ironman this summer. Christine writes: "...Just wanted to say 'Thank you' for a memorable ride on Saturday. I was telling some of my tri-friends about the sport of Randonneuring and many have not heard of it, as I had not until Harold introduced me to it. I must say after having spent time with the group, I have a new found respect for the sport of cycling. To me, the many riders that partook in this event, being pure cyclists, were the most friendly, down-to-earth people I have ever met. It's hard to believe we climbed 7,000 feet that day, yes, I remember it was hilly, yet the scenery helped me to forget and made it more bearable..."
If you have any other comments, stories, or pictures to share, post them below or forward them to me. Next up is the PA600k this coming weekend. The 400k loop on day 1 covers much of the Hawk's Nest 200k route. However, at Dingman's Ferry, you will head over to the PA side of the Delaware Water Gap park, for some easier terrain back to Water Gap. If you are planning to ride and haven't registered yet, let me know via e-mail, and you can still take advantage of the early registration discount (which has now expired on the Active.com online registration). The turn-around controle on Day 2 in Leola is a Turkey Hill, which has limited options for food. You may want to just make that a quick stop, and then go to the Sheetz in New Holland which will have more food choices and is a bit nicer. The coffee shop that Rick mentioned in his pre-ride will not be open on Sunday. C1 to C3 (Snydersville PA) – No issues to report through this section, except the road surface is still roughed-up on Weaversville Rd from Airport Rd (Rt. 987) to Nor-Bath Blvd (Rt.329). C3 to C5 (Port Jervis NY) – No issues to report through this section, cues in good order. 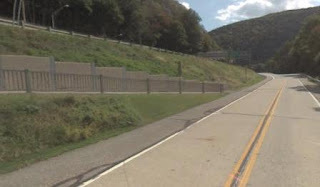 C5 to C6 (Water Gap PA) – Bridge out on Rt. 209 at Egypt Mills, aprox. 8 miles south of Dingman’s Ferry Bridge. Bridge surface tore-off exposing concrete superstructure; I recommend using the well-marked short-duration bypass (Tom’s Creek / Little Egypt Rd), rather than facing the hazard created by crossing traffic twice on this heavily-travelled section of highway. Also of Note: Please advise participants to be especially aware of traffic on River Rd after leaving DWG NRA and nearing Shawnee-on-Delaware Resort / Buttermilk Falls Rd. to the Del. Water Gap. This is a heavily-travelled section - which for some reason - consistently tends to concentrate inattentive drivers travelling at inappropriate speeds. C6 to C7 (Bloomsbury NJ) – Bridge is really, totally out on Rt 173 at Bloomsbury immediately before reaching CITGO Controle. Detour Recommendation: After passing Rt. 639 / Warren Glen road on right, I recommend turning right onto Rt. 579 Church Rd & crossing metal bridge, then 2nd left onto Brunswick Avenue through Bloomsbury, then TR continuing onto Rt. 173 after bridge construction (C7 located 500 ft straight before intersection with I-78). Upon leaving C7, backtrack this detour to BL onto Rt. 639 / Warren Glen Rd., resuming route. C7 to C8 (Weisel YH) – After backtracking the Bloomsbury bridge-out detour (described above), no other issues to report for this section. · Mine Run Rd at int. with Limerick Rd. I would add a cue here; “cont. straight onto Limerick Rd” to avoid any potential confusion. · Mile 266.0 Ridge Pike This is not a TL (Limerick Rd cont. straight across Ridge); make this an “L (SS) Ridge Pike”. Also, I would show C9 as actually being at mile 266.1 (further down on Ridge than one would think reading current cue). C9 to C10 (Leola PA) – No issues, except that you may want to add a cue in Blue Ball where Rt. 23 crosses Rt. 322; “X Rt. 322 (TFL) – use caution”. A potentially confusing intersection for those unfamiliar with this locale, with a short, somewhat steep uphill slope. Coffee Shop located about ¼ mile past the New Holland Sheetz. · Cedarville Rd / Keim St. – Possibly show as a “4-way stop”? · Cedarville Rd / Miller Rd – Possibly show as a “4-way stop”? C11 to C12 (Weisel YH) – No issues with this section. - Instead of going into Hawley (which has a lot of traffic), the controle stop will be just beyond Promised Land. - In Port Jervis, the controle has moved from the Dunkin Donuts to the diner in town (mainly to avoid the high traffic area around the Dunkin Donuts). - The first controle stop on day 2 (after the sleep over stop at the hostel) is now just a postcard mailing. Since postcard controles are not timed, this will allow you to get a later start after sleeping and ~100k to reach the turn around controle in Leola which is the first closing time you will need to meet after your sleep stop. There will still be an open/close time listed for the postcard controle which you may use to see if you are on pace or not - but the closing time does not need to be met. The 24-hr Limerick Diner is just after the postcard controle, and would be a good place to have a nice breakfast. - The outbound leg on day 2 is directly routed on main roads. Since most riders will be starting the 200k segment after the sleep controle around 2-5AM, there should be very little traffic. This should make the navigation a bit easier and allow riders to catch-up on the time limit, if they get a late start. 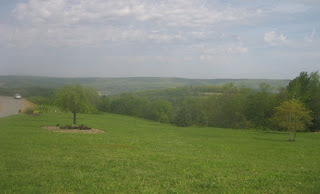 - The inbound leg on day 2 closely follows the recent PA400k finish, and is routed along quiet side roads. Rick Carpenter will be doing a preride checkout, starting on 5/14. There will probably be at least one more cuesheet revision with any corrections or clarifications from the preride. Rick assures me that Ed Pavelka's course record of 29:15 is secure, since he's tapering down now for his upcoming solo RAAM. The diner is not officially open yet, but owner Jeff Ioannidis says he'll have coffee and water available for us at the start. There are 2 mini marts near by on Broad St, if you need any last minute supplies or snacks. If you want to top off with a more substantial breakfast, the Portland Diner (5 miles south on Rt 611) is a very good option -- I'll be there around 5:45AM, if you want to eat and sign-in early. For a post-ride gathering, meet at Dough Boy's Pizzeria which is 1 block away from the Water Gap diner at the junction of Broad St and Rt 611. The Water Gap diner is still the official start/finish location -- we'll have the rider meeting at the front, 10 minutes before the ride start. Thank you very much for the Water Gap donations you sent in the mail ... I'll be passing these along to Jeff on Saturday. There currently are 19 riders planning to clip in, with many first time participants -- I know the veteran riders will make them feel welcome and help as needed. Looks like a great weather day for a change ... those NW winds in the forecast should speed our way on Rt 97 along the Delaware River all the way to Port Jervis. ... if you watch the video in the link above, you'll see that Jeff is wearing an EM1240 polo shirt! I'll deliver any checks I receive to Jeff, on behalf of the Eastern PA participants, on the May 15th 200k which will starting and finishing at the Water Gap Diner. May 15th happens to be Jeff's birthday as well, so let's make it a great day for him. Many thanks, for your help and support! Please note that the start/finish location has been changed to the Water Gap Diner. .... if you're planning to join us too, please drop me a note.